The stable, accurate flights of the Aerobie Superdisc Ultra result from its advanced aerodynamic design which incorporates the patented spoiler rim with a soft rubber edge for comfortable catches. The original Aerobie Superdisc became a favorite shortly after its debut in 1995 because players of all skill levels could throw it well and enjoy its stable, accurate flights. The Superdisc Ultra was developed in response to Superdisc fans’ clamor for a larger, heavier version. 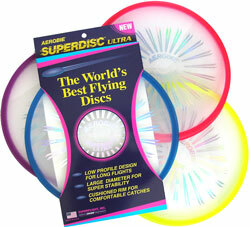 Today, the Superdisc Ultra is the top of the line Aerobie flying disc. The Superdisc Ultra’s soft rubber edge provides a great grip for strong throws. It also feels soft to catch and does not develop sharp scratches and burrs like a conventional disc when it hits pavement. Floats in water. Size: 12 inch diameter. Weight: 162 grams. Available in yellow, red, and blue. Ages 10 and up. Quality made in the U.S.A.
Also try the smaller 10 inch version, the Aerobie Superdisc.